Infants don’t often develop full control of swallowing and the muscles of the mouth until they are between 18 and 24 months old, so drooling is normal in the first two years of life. Babies might also drool when they’re teething. Drooling is part of normal development in almost all children, however not every child stops drooling. We produce more than 500mm of saliva a day – imagine not being able to control all that saliva. This is what happens to some children with disabilities or when there is impairment of nerves or muscles in the throat. Some examples include Cerebral Palsy, Down syndrome, head injuries, Muscular Dystrophy, seizures, and stroke. Drooling can also be caused by an underlying physical condition, such as enlarged tonsils, or by facial structure. If your child cannot stop drooling, it is important that you speak to your paediatrician. Sometimes the problem requires more intensive medical intervention. Swallowing difficulties can result in life threatening problems, so always consult a physician to rule out any complications. Blowing Bubbles – this is a great and fun way to help stop drooling. Practicing lip control will help your child to develop the strength, range of motion, and skill required to help with the problem of drooling. Whistles – will help your child to practice the lip control they need to stop drooling. It may be noisy to your ears, but it’s worth it. Straws – these require your child to use lower lip control and develop the facial muscles required to stop drooling. 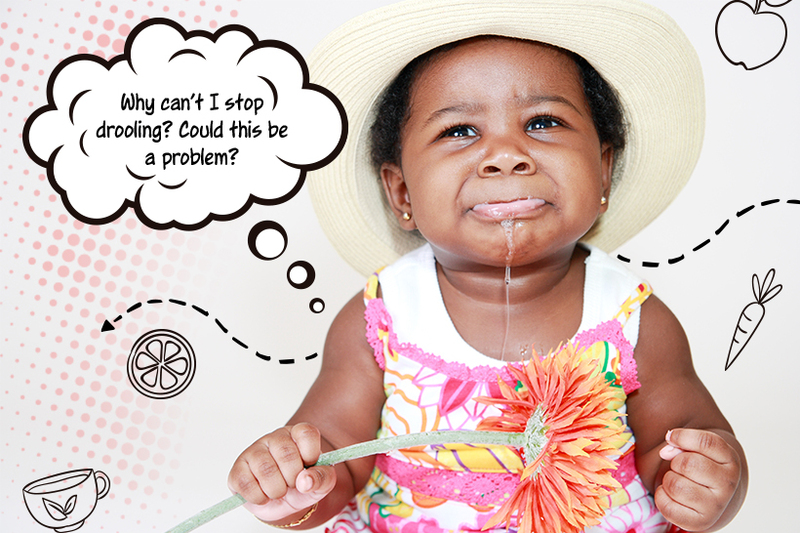 When appropriate, allow your child to drink from a straw, rather than a Sippy cup which can make drooling worse. If he needs help learning to use a straw, try using a juice box. Put the straw in his mouth and squeeze enough to give him a taste of what’s inside. Cotton Ball – this is a good lip exercise. Place a cotton ball on a flat surface and have a race to see who blows faster and whose cotton ball goes further. Remember that we are here to offer advice and support if you are dealing with this issue. Feel free to speak to one of our friendly team members.